Autumn Basket With Birds Kit New! Includes: Belfast linen, rick rack, buttons, fabric lining, ribbon, needle, chart & complete finishing instructions. 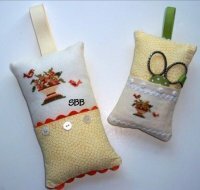 The kit contains a pre-finished case with a linen insert, 2 charts and a butterfly button. 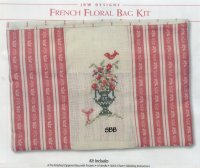 The kit contains a pre-finished zippered bag with pockets, needle, chart & complete instructions. The kit contains a pre-finished case with a linen insert, needle, chart and complete alphabet for personalization. 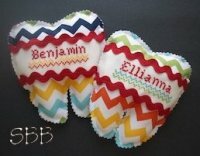 The kit contains the tooth-shaped pillow in a colorful chevron print, with a linen and rick rack insert for the child's name. A little pocket on the back will be perfect for a baby tooth and the fairy's money.